A new integral blind from Sunshade Blind Systems now offers a choice of operating methods for their well proven integral blinds. This addition to the Sunshade range is available NOW! In addition to the very popular sliding magnet system it is now possible to have the same blinds with a pull-cord operation in the integral window blinds. Mounted on the internal face of the double glazed unit the cord drives a rotating magnet giving the customer a user-friendly control system. The cord both raises and lowers the slats as well as tilting and tuning them, giving one system to control all functions. As with all Sunshade blinds the cord system provides a hygienic, dust free, low maintenance and contemporary feature for any double glazed window or door, coming in fourteen colours including anthracite grey and black. 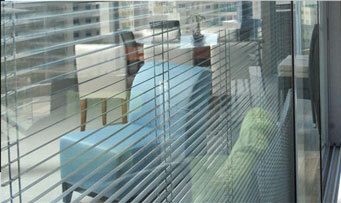 Our integral blind units are manufactured by experienced staff in a high tech factory. The blinds are sealed within the double glazed unit cavity which is then filled with inert Argon gas. All blind units are made with toughened glass, are filled with Argon and have a leading softcoat (low emissivity) film applied. This gives the best possible thermal performance, well exceeding the legal requirement. The proven reliability of Sunshade blinds has been demonstrated over the years and is backed by guarantee. Being the UK Main Agent for these blinds Sunshade can offer the best delivery times and prices in the country, and you can rely on their outstanding after-care and customer support.